Enjoy San Francisco's gorgeous scenery with a 4- to 5-mile (6.5- to 8-km) walking tour of the city's western edge, following a unique path along the dramatic coastline. Start on the Golden Gate Bridge for unrivaled views of San Francisco Bay and the city skyline. Then enjoy a slow-paced hike along the Pacific Ocean, passing through Baker Beach and Sea Cliff en route to the Sutro Baths at Land’s End. This small-group tour is limited to 12 to provide more personalized attention. 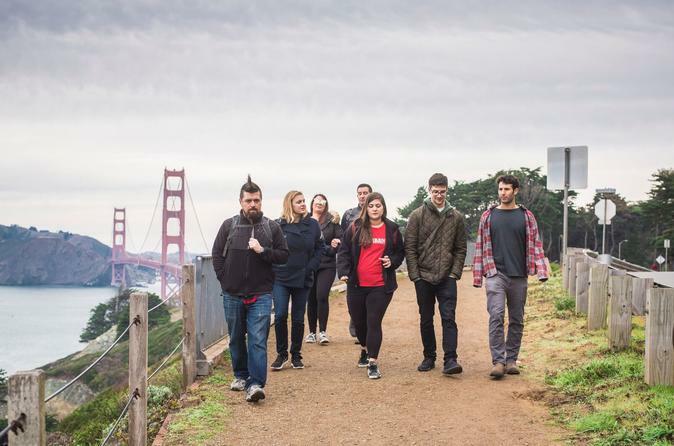 Your San Francisco walking tour starts at the Golden Gate Bridge, where you can stroll out for panoramic views of the bay and city skyline (barring San Francisco's famous fog, of course). Listen as your guide points out notable features and shares the history of this world-renowned bridge, constructed in 1937. Then begin your leisurely hike along the city's rugged, hilly Pacific coastline while pelicans soar overhead and barges glide past in the bay. When you see the Golden Gate Bridge come back into view, capture postcard-perfect images from different angles with your camera. Walk along the sandy shore of Baker Beach, and take a break to chat with fishermen casting lines into the sea. Then climb the steps into Sea Cliff, one of San Francisco’s most exclusive neighborhoods, and admire plentiful mansions with their manicured gardens and fine architecture. You can also enjoy clifftop views of the crashing surf from lookout spots such as Eagle’s Point. Follow the trail down to the Pacific’s edge to explore the ruins of the Sutro Baths at Land’s End, now part of the Golden Gate National Recreation Area. Learn about the concrete remains of the former glass enclosure that once boasted seven indoor swimming pools, created by wealthy entrepreneur and former San Francisco mayor Adolph Sutro in 1896.